TVS NAGAR as it is popularly called in Covai is located in between Thadagam Road and Mettupalayam Road and both these roads are of high importance for commuting towards Kanuvai, Anaaikatti, Thadagam, Agali, Silent Valley towards Kerala Border and Towards Karamadai, Mettupalayam, OOty, Coonoor, Kothagiri towards Nilgiris. 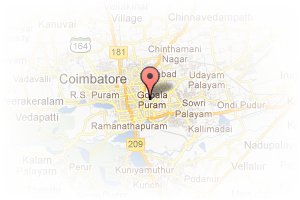 Address: 22/14 PRR NAGAR 3RD STREET COIMBATORE, PN Pudur, Coimbatore, Tamil Nadu, India. 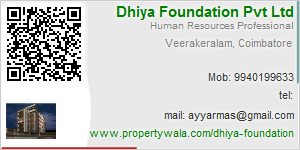 This Builder Profile page for "Dhiya Foundation Pvt Ltd" has been created by PropertyWala.com. "Dhiya Foundation Pvt Ltd" is not endorsed by or affiliated with PropertyWala.com. For questions regarding Builder Profiles on PropertyWala.com please contact us.